Each component of this year’s program will focus on developing personal and community religious journeys as Unitarian Universalists: who am I? who are we? 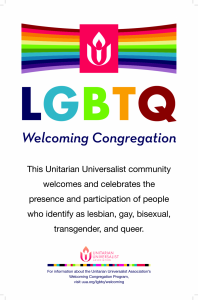 How do we connect as Unitarian Universalists to each other within our congregation, community, and the world? Children and adults will explore how they and their Unitarian Universalist community answer the questions of how to live and grow together. In this program, children identify intangible gifts central to Unitarian Universalism such as friendship,hospitality and fairness, and share these gifts with others. This program explores all the Principles in the context of Beloved Community of family/home, school, neighborhood. Participants engage in activities that emphasize the love they feel in community. Equips children with language and experiences to develop and articulate a strong Unitarian Universalist faith identity. Through historic and contemporary stories of Unitarian Universalist faith in action, participants embark on a pilgrimage of faith, exploring how Unitarian Universalism translates into life choices and everyday actions. Stories about real people model how participants can activate their own personal agency – their capacity to act faithfully as Unitarian Universalists – in their own lives, and children have regular opportunities to share and affirm their own stories of faithful action. Love Connects Us celebrates important ways Unitarian Universalists live our faith in covenanted community. Moved by love and gathered in spirit, we embrace our responsibility toward one another and the world at large. We encourage one another&#39;s search for truth and meaning. We strive to be active in peace-making and other efforts to improve our world. The metaphor of windows and mirrors represents the dynamic relationship among our awareness of self, our perceptions of others, and others’ perceptions of us.